Easy Copper Charms Or Ephemera Contributed by Pam Sisler. Making beautiful charms does not involve a lot of special equipment, time or money. 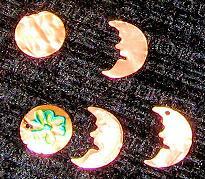 Use these easy-to-make copper charms in jewelry-making or in scrapbooking. Create an inexpensive coin charm for belly dancing costumes. They make wonderful charms on light-weight earrings or use as ephemera. There are thousands of ways to use these easy-to-make copper charms. Most of the items you probably already have around the house. 1. Punch out the copper in the desired shape. It may help to stand on the punch using the weight of your body to press it down. 2. Punch out the hole for hanging the charm or as a design element if needed. 3. Lightly sand around the edges to remove any burrs and dull the edge. Be careful as the metal can be sharp. Stamp the charm with "StaysOn" ink or similar permanent ink. The item may be embossed (hammered) with a leather tool and/or scribed with an empty ball point ink pen or large nail and the resulting raised surfaces highlighted. Create a patina by soaking the charm with a mixture of � tsp salt 1 � tsp household ammonia 2 tsp vinegar Dip item in mixture. It may take 20 minutes or more to show results. It is dependent upon weather conditions. Reapply if the solution dries. The corrosive action essentially stops when it is in dry. When desired result is a acheived, wipe the surface with a dry soft cloth. Purchase a specialty chemical designed to create distinct patinas on the copper. You can choose from various colors. Novacan Black patina was used in the photo.